The outlook in this picture, histor­ically so interesting, is toward the northeast. In the distance, at the extreme left, is seen the south front of the Treasury Building, with its Ionic columns, and the Capi­tol would appear on the right if the view were a trifle more ex­tended in that direc­tion. On the far side of the monument and close by it, is a shallow pond known as Babcock's lake - a sort of backwater extension of the Potomac - which was filled in later and thus obliterated, as a precaution against the possible undermining of the obelisk by seepage. 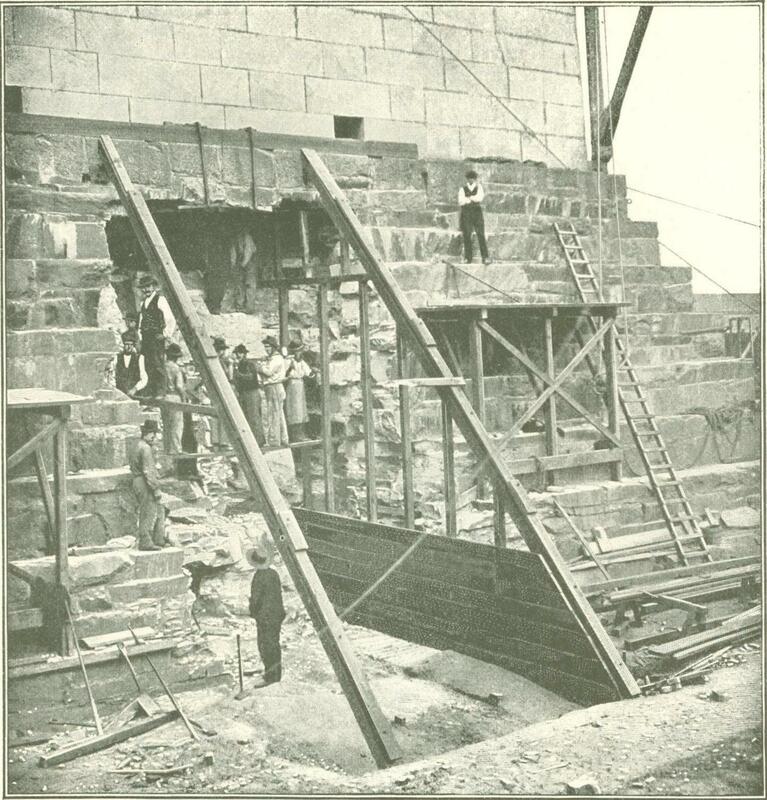 The door shown in the, photo­graph, on the west face of the shaft, was afterward removed, the opening being closed with marble blocks, and the present entrance cut through on the opposite side. The fact may be recalled that, in 1783, the Continental Congress voted to erect an equestrian statue of Washington, and Major L'Enfant, in his plan of the capital city, marked for the site precisely the spot on which the great obelisk now stands. But this idea was not carried out, and the matter lay by until George Wash­ington died, when another resolution was passed providing for a monument in the Capi­tol, beneath which the hero's body should rest. Mrs. Washington, however, preferred that he should repose at Mt. Vernon, and nothing more was done till 1823, when citizens of Washington formed a so-called Monument Associa­tion and started in to do something. Popular subscriptions were invited, and in 1848 by which time eighty-seven thousand dol­lars had been collected, the corner-stone was laid. When the money gave out, the con--traction had to stop, and it was recommenced only when Congress, awakening at last to its duty, gave two hundred thousand dollars in a lump and assumed charge of the whole business. Looking at the photograph already spoken of, the eye of even a casual ob­server might be struck with the small size of the foundation of the monument, rela­tively to its enormous proposed height. This, indeed, was a vital defect in the original plan, and the Army engineers, in whose hands the work was placed by Con­gress promptly set about correcting it. They dug it out - it was mere rubble - at the corners and at the sides, shoring up the undermined structure meanwhile with great beams. They even burrowed a con­siderable distance under the obelisk itself, finally replacing the material thus ab­stracted with concrete, which was added in quantities sufficient to extend very largely the area of the foundation. The first foundation, indeed, covered only six thousand four hundred square feet, whereas the new one covered sixteen thousand square feet and was in effect a single block of solid stone - a monolith. The final result of this ingenious perform­ance is shown in the fourth photograph, which exhibits the new foundation com­pleted. Here is at last something satisfactory to build upon, and the business of construction now actively proceeded. Day by day the great stump rose up­ward and popular interest in the nation's memorial revived as the obelisk neared completion. 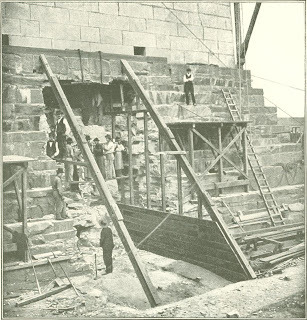 The derrick-topped shaft became an object of interest to every visitor to Washington, and many were the appli­cations for permission to ascend to the point where a score of workmen could constantly be seen raising the marble blocks with the help of derricks and placing them. 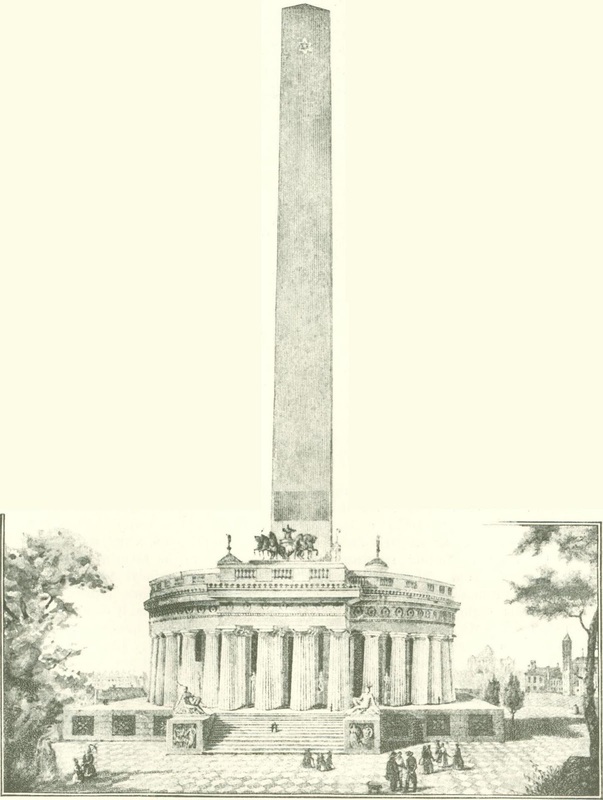 In horizontal section, the monument is a square within a square; the building is an iron tower within a marble tower, the former being securely fastened to the latter by a winding staircase, in which an elevator runs. There are twenty-three thousand stones in the entire structure, which weighs eighty-one thousand one hundred and twenty tons. To strengthen the foundation in the manner described cost ninety-seven thousand four hundred and seventy-three dollars, and the sum total of expenditure for creating the obelisk was about one million three hundred thou­sand dollars. The walls are fifteen feet thick at the base, dwindling to eighteen inches at the top, and the pyramidal cap­stone weighs thirteen thousand pounds. This last was put in place December 6, 1884, and the finished monument was dedicated in the following February. The original design for the monument, drawn in 1846, was very different froth the one finally adopted. It was a circular colonnade, two hundred and fifty feet in diameter and one hundred and fifty feet high, supported by four concentric circles of Ionic columns, and upholding an obelisk five hundred feet in height. Thus, if built according to this plan, which was "earnestly recommended to the favor of our country­men" by John Quincy Adams, Zachary Taylor, Millard Fillmore, Daniel Webster, Henry Clay, and others, it would have had an altitude nearly one hundred feet greater than the present shaft. The colonnade was to have enclosed a hall for statuary, and a chariot of Fame drawn by six horses was to have surmounted the main entrance. It is believed that nothing short of an earthquake could destroy the Washington obelisk. On several occasions it has been struck by lightning, but has suffered no serious injury, thanks to a most ingenious and admirable arrangement of conductors. The capstone is crowned by a small pyramid of aluminum weighing one hundred ounces and this is connected with rods that pass six hundred feet down into a well below water-level. 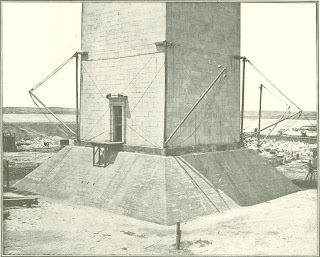 In April, 1885, this pro­tective contrivance was severely tested, five immense bolts being seen to flash between a passing thunder-cloud and the monument, within twenty minutes. No damage was done, but two months later a tre­mendous stroke slightly cracked one of the stones near the top. When the building of the monu­ment was begun, commemorative tab­lets for the adornment of its interior were contributed by various states of the Union, by some foreign powers, and by a number of municipal and other organizations. Quite a number sent in by mercantile concerns were in reality advertisements, and much sur­prise was caused by the mysterious and unaccountable disappearance of most of these during the construction of the obelisk. As a matter of fact, the missing stones were privately buried beneath the earth which was thrown up to cover the new founda­tion, this method of disposing of them being adopted to avoid the em­barrassment of refusing to accept them, and to this day these handsome marbles rest peacefully beneath the greensward which carpets the hilltop about the shaft. While the monument was going up, all of the tablets were housed in a shed nearby and a few of them are believed to have been stolen. At all events, one sent by the Pope is known to have been carried off by persons of the Know-Nothing Party, smashed to bits and thrown into the Potomac. After undergoing a variety of hazards, the carved me­morials of stone and marble, of which one hundred and seventy-six were accounted for, were built into the inside walls of the obelisk, where they have suf­fered since then all sorts of injuries at the hands of vandals and relic-hunters, forty of the principal ones being badly damaged, while most of the others are disfigured with pencil-markings, wads of tobacco, and drops of oil from the elevator machinery. Every projecting bit of carved stone has been broken off: William Penn lacks a thumb and forefinger, a cow in the Vermont coat of arms has lost her horns, several spokes are absent from the driving-wheel of a locomotive, the silver letters from the Nevada tablet have been dug out, and Washington himself wants a nose. Even at the present time, looking at the monument, one sees quite plainly the line of demarcation be­tween the old stump and the structure superposed in 1880. This is due not to the greater age of the stump, but to the fact that the newer marble has a different grain from the old. One gets a notion of the vastness of its size from the statement that an army of twelve thousand men could be com­fortably housed in its interior.